A plethora of tassel colors and designs can enhance your traditional bedroom or living room window treatments, taking them to the next level of elegance. 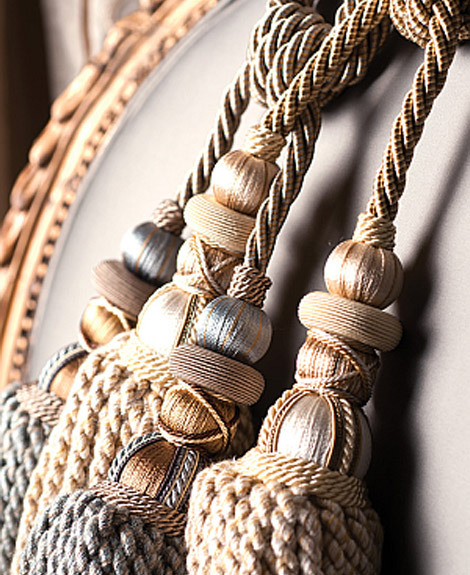 With hand-loomed and beautifully twisted threads, these finishing touches can be created to perfectly match or simply coordinate with the colors of your drapery fabric. This accessory can be successfully used with either contemporary or Asian-inspired décor. 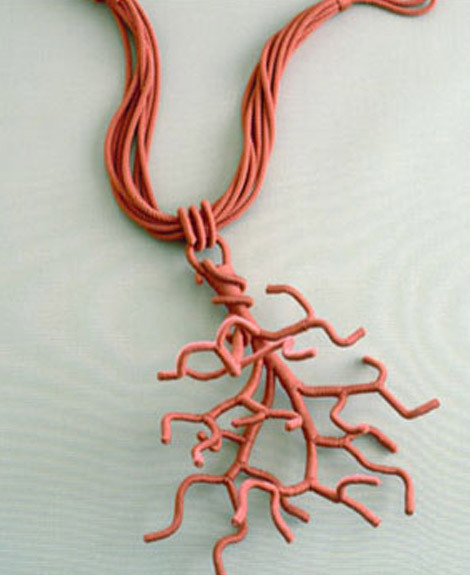 The coral-colored tieback will add texture and dimension to a simple window treatment, just like a unique necklace at the neckline of a little black dress. This tie back can coordinate with similar colors or stand out against beige, white, or pale blue curtains. 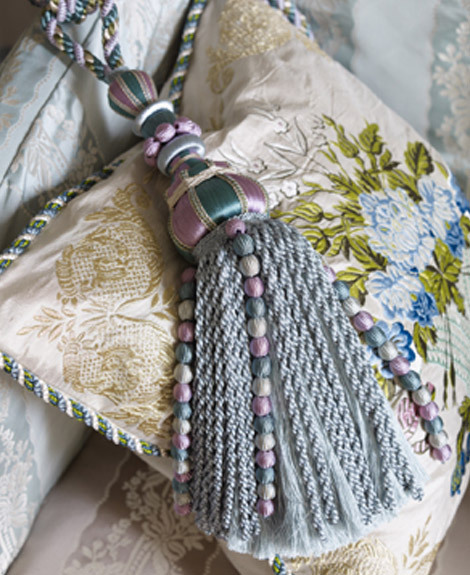 This large and impressive tassel can be used on window drapery or as a tie back of a bed curtain. Its luxurious tassel and crystal bauble gives a sparkle and an elegant feel to a formal living room or bedroom. 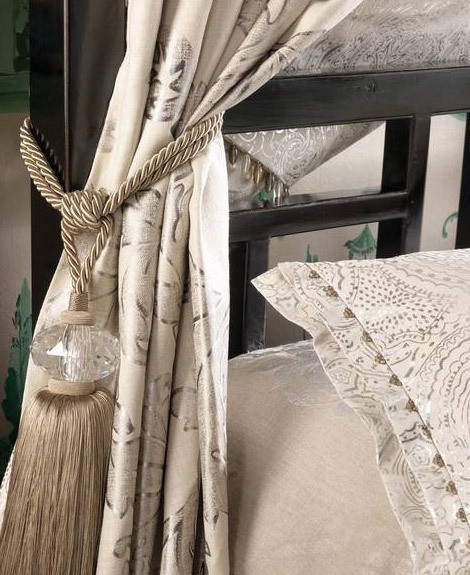 Match it to traditionally patterned fabrics or beautiful silk window treatments. 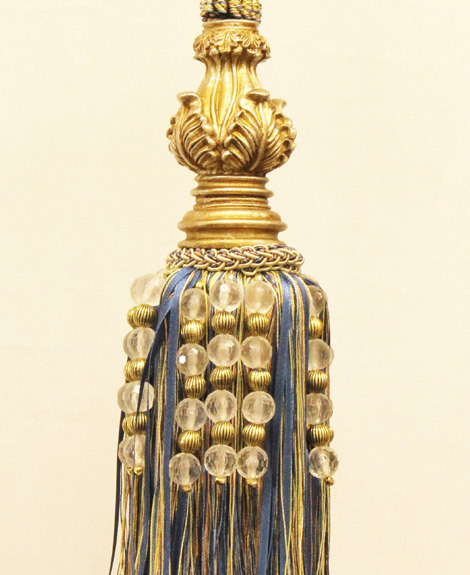 With its crystal and gold leaf beads and end cap, this tassel has a combination of old-world elegance and pizzazz. Its coordinating thread and ribbons can enhance the colors in your window treatment and throw pillow fabrics. This is the perfect finishing touch to a formal living room or bedroom décor. This tassel and tie back have amazing style and an interesting texture created by using several different thread colors and a twisted thread design. This is perfect as an accent for both contemporary and traditional décor. Use it to enhance window treatments or pillows; match the colors of the fabric design for an elegant touch. 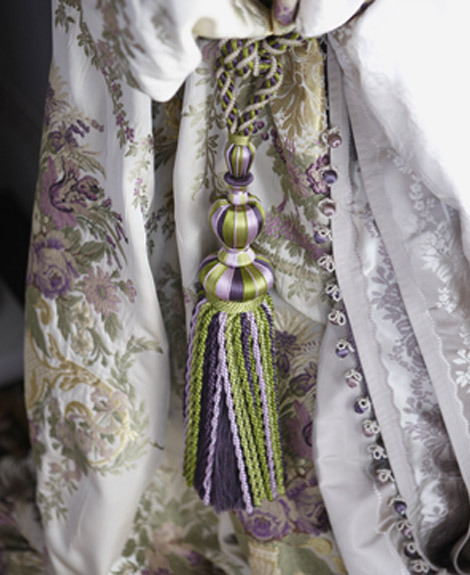 With a unique combination of several shades of purple and green, this drapery tie back and matching decorative tassel adds a gorgeous finishing touch to both modern and traditional fabrics. The hand-loomed and twisted threads of the tassel bring out the luxurious look and feel of embroidered fabrics and watered silk. 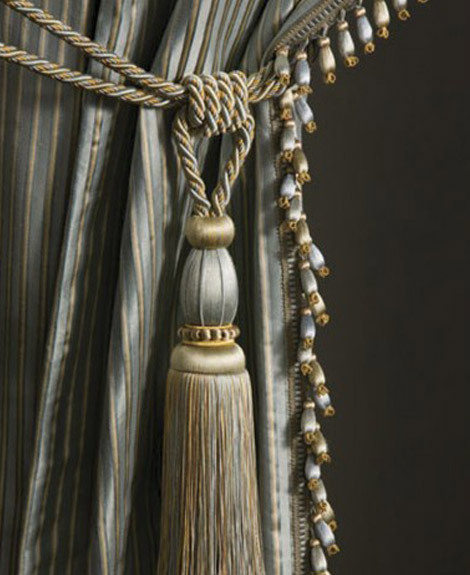 The blue-gray and tan colors of this tassel coordinate with a number of traditional textiles, whether its pattern is floral, striped, or solid. 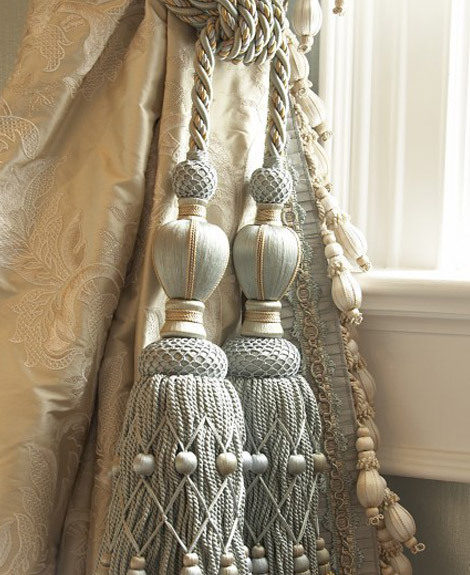 This simple tassel design enhances the window treatments or pillow without overwhelming them, but its size will still stand out. Consider using the matching garland to line the edges of the draperies as well. 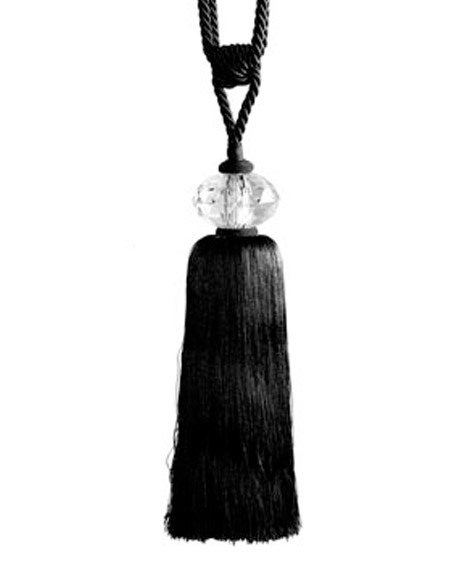 Sleek and black, this stylish tassel is ideal for a more contemporary looking room. The jewel adds a touch of elegance and panache to a modern bedroom or dining room window treatment and can easily complement any décor theme. Use with light colored fabric enabling the tassel to stand out even more. These drapery tie backs are the ultimate in elegance with their tiny covered beads and uniquely woven threads in pale blue and light tan. A perfect accent for window treatments in a luxurious and traditional living room, sitting room, or bedroom, add them for the ideal and impressive finishing touch.